To start knitting toe-up socks, you cast on and knit the toe. Once you have reached the total number of stitches for the sock, it’s time to knit the foot. For a simple stockinette sock continue knitting even (without increases) in the round until the sock measures approximately 2 inches less than the desired foot length. Once you complete the toe, you can add any patterning you like. Many stitch patterns are presented through the use of charts. A chart is a pictorial representation of the knitted work viewed from the right (public) side. Each box in the chart represents 1 stitch in the knitting. Sometimes a chart incorporates stitches that must be worked only once, no matter how many repeats of the main pattern are worked. These stitches occur at the beginning or end of the chart and the beginning or end of the round or row. The main pattern stitches that are repeated are often outlined in red, bolded boxes. If you are adapting a pattern written for top-down socks into toe-up socks, you need to think about one major consideration: the pattern’s direction. 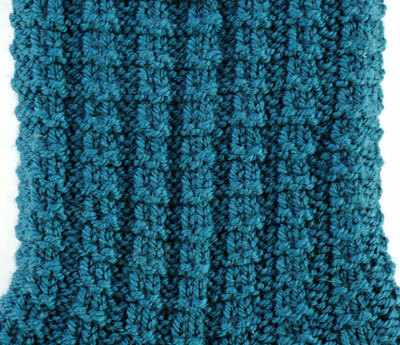 Many stitch patterns appear the same when knit in a different direction—ribbing, for example, looks exactly the same if knit from the top down. However, other types of stitch patterns do not appear the same when knit toe-up instead of top-down. If you follow a top-down pattern exactly, cable patterns appear to cross in the opposite direction than intended once you complete the sock. Some lace patterns, such as those with diagonal lines, also appear to lean in the opposite direction than intended. Patterns such as leaves appear upside-down. 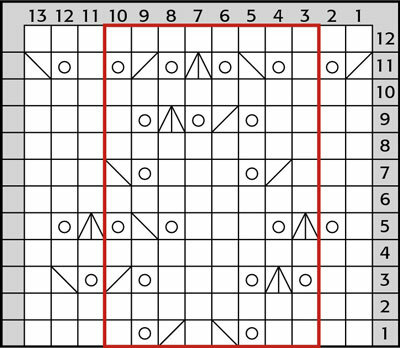 When working from a chart, you can adapt a top-down stitch pattern by reading the chart in the opposite direction—simply turn the chart upside-down to read. However, depending on the type of stitch, this might not work because stitches often depend on the preceding stitches—when working the chart upside-down, the rounds are in the opposite order as well. Stitch patterns that contain only knit and purl stitches are easy to work in the opposite direction. If the pattern is square, like the Waffle Pattern, the texture will appear identical whether it is worked toe up or top down!